Dogs from all walks of life need a designated outdoor space, but sometimes that can be hard to come by. 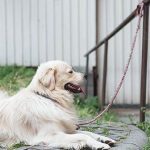 If you’re living in a condo or apartment, or maybe don’t have a fenced-in backyard, how can you be sure that your dog is getting enough time outside? 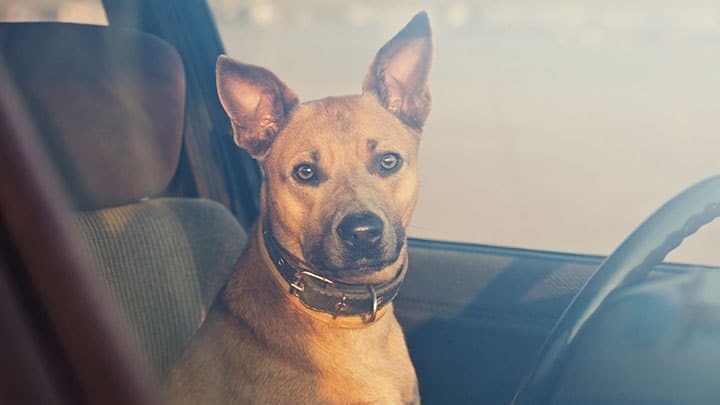 It’s not always possible to see that your pup gets adequate fresh air and exercise each day, but that can be achieved a lot easier with the help of an outdoor kennel. Kennels, playpens, dog runs, fencing, and dog houses exist to offer your pet a safe and secure play area outside without the supervision of frequent neighborhood walks. What really makes this outdoor kennel standout is the ability to add on combined with the option to have a shaded area via the canvas top. This high-rated Advantek Pet Gazebo is as cute as it is functional. With a sleek and customizable design, these gazebos are great as a standalone crate, or can be joined up for a custom outdoor playpen. 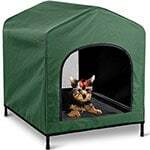 Great for safely containing your pet, while giving them some fresh air and sunshade, these gazebos are made of durable steel and built to last. 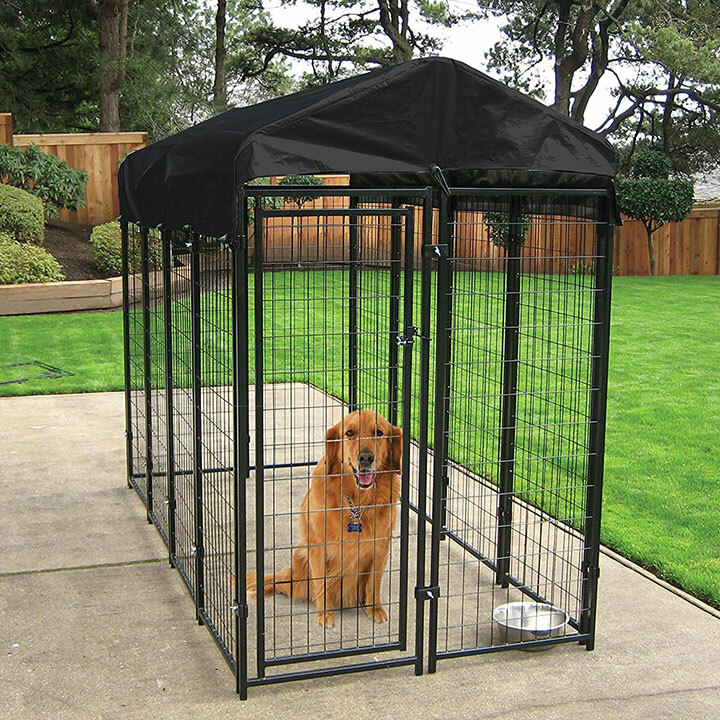 Pros: Foolproof design that keeps your pet contained and protected from the sun. Cons: Minimal protection from other elements, like rain. Perfect For: Pets that need a safe space to lounge outside. Below, we’ve compiled a list of the Top 10 outdoor spaces for your dog to help you make the right decision for you, your yard, and your dog! Whether your pooch loves lounging in the sun or not, too much sun exposure can lead to heat exhaustion or skin conditions in some cases. A good outdoor kennel should protect your pup from the elements, offer enough room for food and water bowls, and give them adequate space to play. The ideal dog kennel should offer protection from other elements as well. Depending on the climate you live in, your choice of kennel should protect your dog from excessive sun, wind, rain, or snow. If you don’t have a fenced-in yard or live in an apartment, your dog may not be able to get exercise outdoors without constant supervision. The security of a kennel lets them get some fresh air and play out in the open air without fear of them running off. 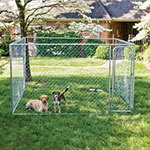 Not everyone has a secure, fenced-in yard they rely on to keep their dog from running away. Kennels are fashioned to be secure, enclosed spaces where you dog can feel the freedom of being off-leash without roaming too far. An alternative use for more more portable dog kennels is traveling. 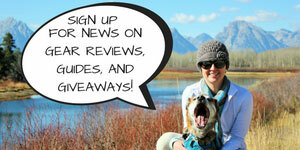 If you’re an avid hiker or camper, travel kennels allow you to bring your favorite pup along for the adventures. 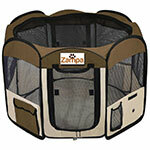 Foldable, collapsible kennel options are available specifically for this purpose. Above we took a close look at our favorite pick, Advantek Original Pet Gazebo, now it’s time to dig a little deeper into the rest of the competition. The uniqueness of this BestPet Heavy Duty Pet Playpen is in its customization options. Black fence-like panels connect together to form the shape of your choosing and make a custom doggy play place in your yard. Set it up as a square, L-shape, or octagon depending on your pets exercise needs! 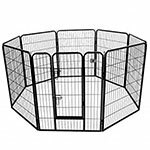 Perfect as a small exercise pen, or just keeping your pup contained in an otherwise open area, this playpen is a great option to have around. Pros: Customization and lightweight for portability. Perfect For: Creating a custom outdoor space for your pet. This customizable fence-style pen can be used in any capacity you can dream up. The MidWest Exercise Pen folds flat for storage and goes where you go. Available in sets from 24” to 48” in height, this is great for any size pup. Featuring a double-latch entrance, as long as it’s secured to the bottom surface, you won’t have to worry about any escape artists. With no-tool assembly, you can have the perfect outdoor space for your pup set up in no time! Pros: Easy to setup and customize. Cons: As it’s not a permanent fixture, you may want to secure the bottom to the ground somehow to prevent escape. 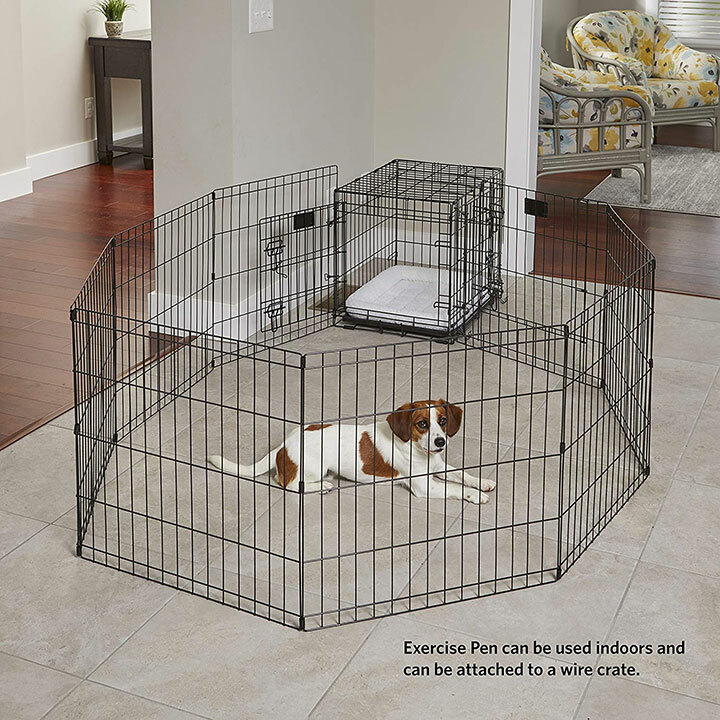 Perfect For: All size dogs that need some extra room to roam. 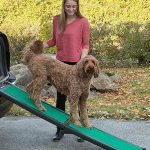 The Zampa Foldable Exercise Pen is an extremely portable, flexible pen that works great for temporarily housing your pet, or acting as their very own tent on camping trips. 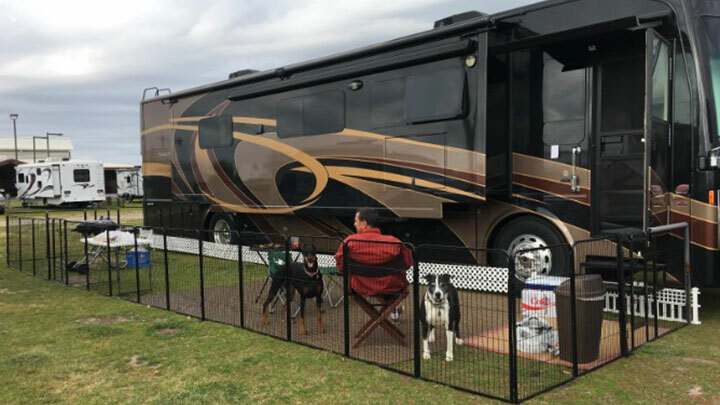 At 3.75’ diameter when set up, it has plenty of room for small to medium-sized dogs that need a place of their own while traveling. 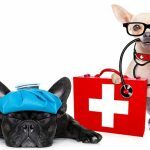 Eight mesh and fabric panels allow for your dog to see out in all directions, which is especially important in anxious pets. When not in use, this pen folds up easily for storage and can be toted around in the carrying case it comes with. Pros: Portable and easy to setup and teardown. Cons: Not a permanent solution to keep outside. 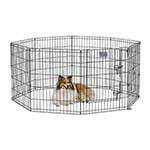 Perfect For: Small to medium-sized breeds that need a contained temporary or indoor space. These Petmate Indigo Dog House are recognizable as a go-to outdoor dog house choice. 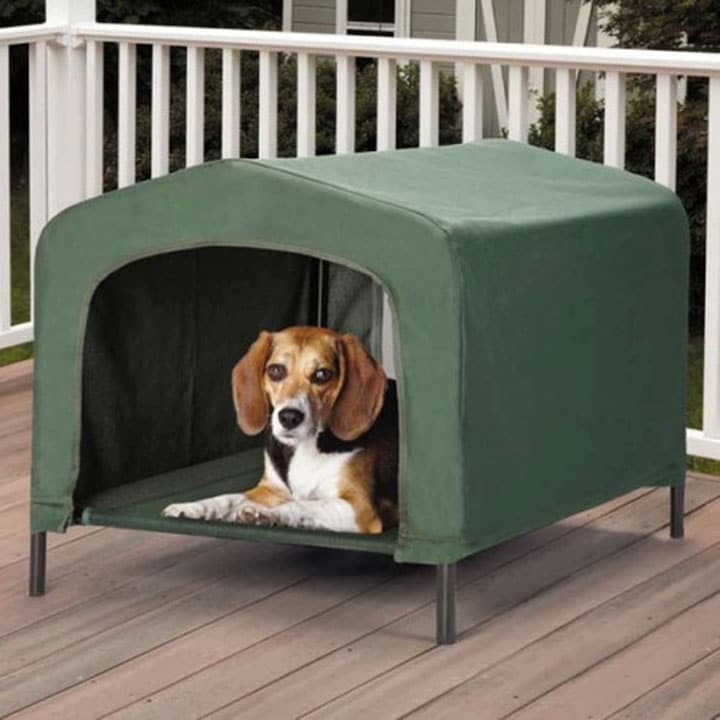 Perfect as a shelter for pups with already fenced-in yards or small outdoor spaces, they offer protection from the elements while being a comfy place to take a nap! Furnished with a roof-ventilation system and constructed with Microban to prevent growth of mildew and odor-causing bacteria, this Igloo-style dog house is easy to keep clean. Cons: Small amount of space. 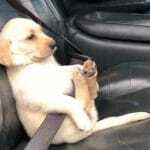 Perfect For: Pups anywhere from 10-125 lbs. that need their own outdoor bed. 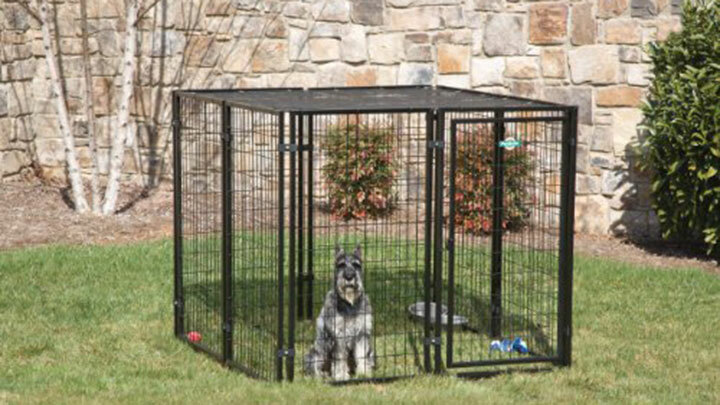 The chain-link PetSafe Box Kennel is made of stable, rust-resistant galvanized steel to keep your pets safely inside. With a large 10×10’ area, this kennel gives pets the freedom to play and nap outside without feeling constrained. Safety is assured, as the door latch has a secure locking mechanism and place to padlock for extra security. Depending on the size and breed, this fenced-in kennel could house two or three pups together for play time! Cons: No included sun or element protection (sold separately). Perfect For: Large dogs, or those that need extra space. This high-rated PetSafe Cottageview Boxed Kennel is spacious and very easy to set up. 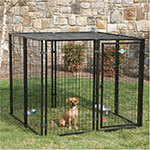 Made of durable, black-coated welded wire, this square kennel makes for an attractive, yet practical backyard fixture. It will give your pet an expansive outdoor space to lounge and take in the scenery from all sides. You can easily customize the door latch to right or left-handed opening and give your dog a safe, spacious outdoor hangout! Pros: Large, easy to assemble, and secure. Cons: Because this is made of wire, not solid steel, strong teeth may be able to chew through. Use your discretion! Perfect For: All sized breeds. Recognized for it’s quality materials and ease-of-assembly, the ALEKO Dog Kennel is ideal for housing pets indoors or out. 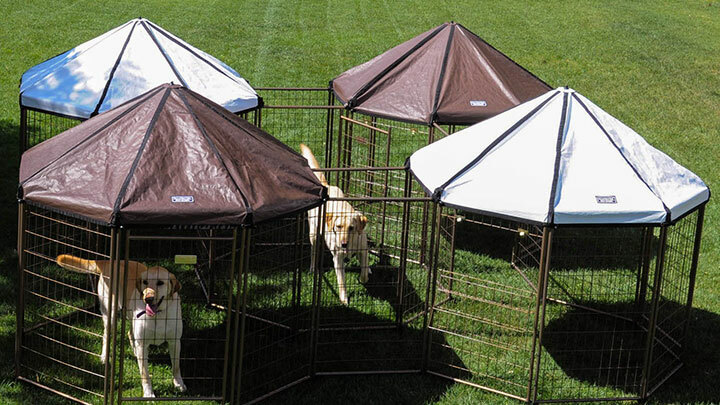 Use one or multiple of this kennel design to create an outdoor playground oasis for your pup! 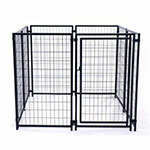 Peace of mind comes easy with this sturdy, 4’ high, pet enclosure. Extremely durable, weather-resistant, and made of powder-coated galvanized steel, this kennel can contain any would-be escape artist. Set it up in your yard for a sturdy shelter that’s built to last. Pros: Heavy-duty and plenty of room. Cons: Doesn’t come with a top cover for sun protection. Perfect For: Setting up a permanent outdoor space for your pup. Whether you have a small backyard, or just need a designated spot for your pup, this heavy-duty Welded Wire Kennel is an excellent choice of shelter for your furry best friend. 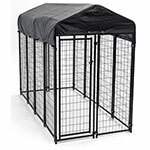 Made of welded steel and wire mesh, this professional-grade kennel is rust-resistant and secure. A steel roof frame and weather-ready waterproof tarp cover protect your pet from the sun, snow, or wind elements. With three available sizes, you can be sure your dog has a personal outdoor space that fits their unique needs! Pros: High quality, easy to install. Perfect For: Small yards and any off-the-leash outdoor needs. 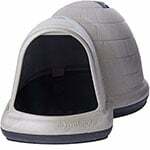 This breathable Etna Waterproof Pet Retreat is perfect for protecting your dog from the elements. The elevated design keeps them feeling comfortable and dry, while mesh inserts at the bottom and back side let air circulate. 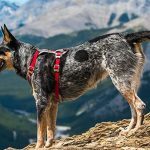 Perfect for impromptu camping trips, or as a shady backyard retreat, this pet retreat is good for smaller or medium-sized pups. Cons: While perfect for napping, this won’t give your dog enough room to roam. 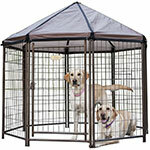 Perfect For: Smaller breeds that need temporary shelter. Drop us a line in the comments below and we’ll help you make the best choice possible!